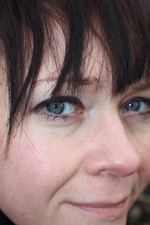 My name is Michele and I’m a problem solver aka Freelance Graphic Designer/Artist based in Staffordshire. For the greater part of my career I have worked as a PA in construction and Town Centre Management which involved marketing and organising large events, from initial concepts through to management. My experience, client side as well as designer side of the fence, has given me a greater understanding of what is needed to catch people’s attention. I changed direction a few years back and decided that as I was getting more involved in creating graphics and promotional material in my role as PA, that I would like to expand my knowledge and so enrolled to study a Foundation Degree in graphic design which I passed with distinction. My dream, one day, hopefully in the not too distant future, is to have a gallery to showcase my own and other local artists/fellow creatives work….so watch this space! I love to experiment in different mediums and have a passion for manipulating text to create images whether using computer packages, print techniques, or by freehand. My love for pushing boundaries and thinking out of the box is my USP. I work alongside clients to mould for them their own unique branding or imagery which helps them to stand out from the rest. In any spare time I have, my passion for photography as a hobby takes over. I manipulate some images within my artwork and for briefs. Take a look at my facebook page for examples https://www.facebook.com/pages/Redroo-Creatives/313624225357761. My birthplace is Australia, though I have lived for the majority of my life in the UK, hence the link to Redroo. Tigerprint (designers for M&S) – April 2009 – Won Male Typography Card Design Competition.